When I went out to the shop this morning the thermometer told me that the inside and outside temperatures where equal — 91 degrees and it’s just 7:30am. This morning, like every other one, began with breakfast, reading the newspaper, and checking emails and FaceBook. A good friend of mine and fellow woodworker had this post on Jamie’s blog and it was a really good read. Lupe has built some really fantastic pieces of furniture in her relatively short time as a woodworker. What really got me thinking is how she embraces all of the new woodworking techniques to accomplish her work. On the other hand, I pursue more traditional practices and consequently, spend a lot more time trying to accomplish what I do. For example, if you read Jamie’s Blog you’ll see that she used a tool called the DowelMax. This dowel jig allowed her to make an 8 drawer chest in a relatively short amount of time. Walking into the shop and being hit by that temperature and then seeing a stack of 1/2″ Soft Maple waiting to be dovetailed for the 9 drawers got me thinking. I do enjoy the process and challenge of hand tool woodworking, matter of fact the process of getting to the final project is probably more exciting to me than seeing it completed. I’ve used the label of Hybrid Woodworker to define my techniques where I’ll use power tools to do the rough work but refine (or try to!) everything by utilizing traditional hand tools and methods. To illustrate that, for the drawers I needed to surface close to 60 feet of 8+” wide Maple for the sides and back. I’m more than happy to use the Powermatic planer rather than a hand plane to make those pieces a uniform 1/2″ thick. Then the router table was much easier than a block plane to put a slight radius on the bottoms of each piece. Today I decided it was time to do a practice dovetailed piece on the soft Maple and you know what? it’s not all that soft! 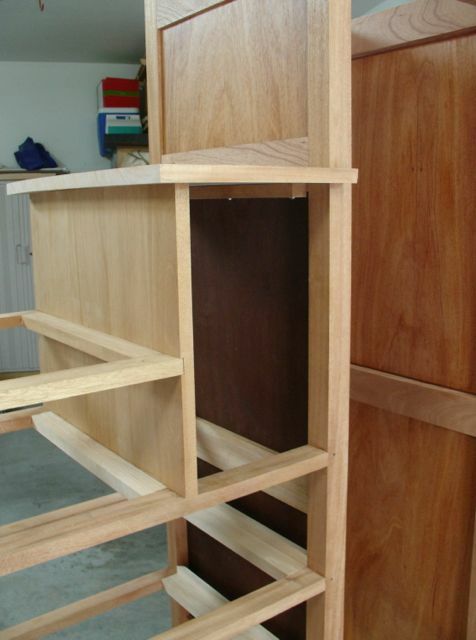 The drawers are three different heights, from 5 1/2″ to 8 1/4″ and the plan is to have the layout similar for each drawer. Starting from the center there will be two smallish tails (about 1/2″) then a 1/2″ space leading to another tail that will begin 1/4″ from the top and bottom of the board. Still undecided on how to treat the backs of the drawers. My first thought was to through dovetail them but after the practice session in 95+ degree heat I’m rethinking that one! Maybe a machine cut sliding dovetail or maybe a pegged tongue and groove joint. Any suggestions? What seemed to work best was to use the chisel for about 4″ and eyeball the depth as in slide #3. Then the router plane brought it to the correct depth. When the router plane became difficult to push I knew it was time to go back to the chisel, you can see that in slide #4. Hopefully tomorrow will be a better day! You probably recall the problems with the Veritas Small Plow Plane so will need to cut the drawer grooves with a dado head instead. That’s another minor roadblock, I’m waiting for the throat plate for the SawStop so I can install the dado head! It may be time to begin the finish procedure on the case, UPS tells me the throat plate is scheduled for delivery mid-week. Relax man, it’s the process right? This entry was posted in Hand Cut Dovetails, Hand Planes, Hand Tool Woodworking, Johns Armoire, Uncategorized and tagged dowel max, drawer construction, hand tool woodworking, Stanley #271, stopped dado. Bookmark the permalink. 5 Responses to What’s It All About and a Stopped Dado! Thank you for your nice comments, John! Indeed, I do love power tools, yet admire craftsmen like you who have mastered hand tools. I have been following the progress of your armoire with interest. One of the items I want to eventually build is a Tansu style Japanese cabinet, with lots of storage. Although I don’t want to tell you what tools to get, my only recommendation for you is that you get at least a nice and decent swamp cooler for your shop – a permanent one, not a flimsy portable thing. I feel your pain in this 100+ heat. Instead of sweating for 3 hours, I think you will not only extend your workshop time, but it will become more enjoyable. The amount of electricity they use is minimal, and when it is dry, your shop gets 15 – 20 cooler. This is probably the best tool we have. I can easily work at least six hours in our workshop in the middle of summer, and it is just a pleasure. As far as your drawers are concerned for me, the easier the better. That DowelMax tool would help assemble them in a third of the time, allowing you to concentrate on the drawer fronts. Lol! I’ve tried the “flimsy portable things” and returned them. The way the shop is located under the second story leaves me with no way to install a good system — Diane frowns on cutting a hole in the upstairs bedroom and putting it in the middle of the room! It is a shame you cannot have a swamp cooler. The next best thing is a inverter split air conditioner. This technology is very popular in Latin America where electricity is much more expensive than the U.S.
My brother has three of these installed around his house, and the electrical costs are minimal. At 15 Seer, you have tremendous efficiency. I’ve looked at those “casually” but price is a concern. I’m going to check out insulating the garage doors which should help keeping out some of the heat. This is going to be one gorgeous piece of furniture John, keep up the good work!